Meandering 26 miles through southeastern Pennsylvania, Darby Creek flows into the Delaware River just west of Philadelphia International Airport. I first visited Darby Creek with Professor Helen K. White and a dozen other undergraduate students from Haverford College as part of a chemistry lab intensive course. 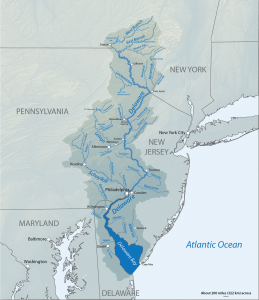 We were studying plastics in the local Delaware River watershed, a region for which no data has been published on microplastics. Arriving in a dramatic burst of rain, we were surprised to find a creek bank littered with as much plastic as organic debris – bottles, wrappers, hair clips, children’s toys. Every square foot of ground contained plastic in various states of degradation, from intact, recognizable objects to sub-millimeter microplastics. Colorful shards were embedded in the soil banks surrounding the small beach. I could imagine them preserved there in the rock record, thousands of years hence. 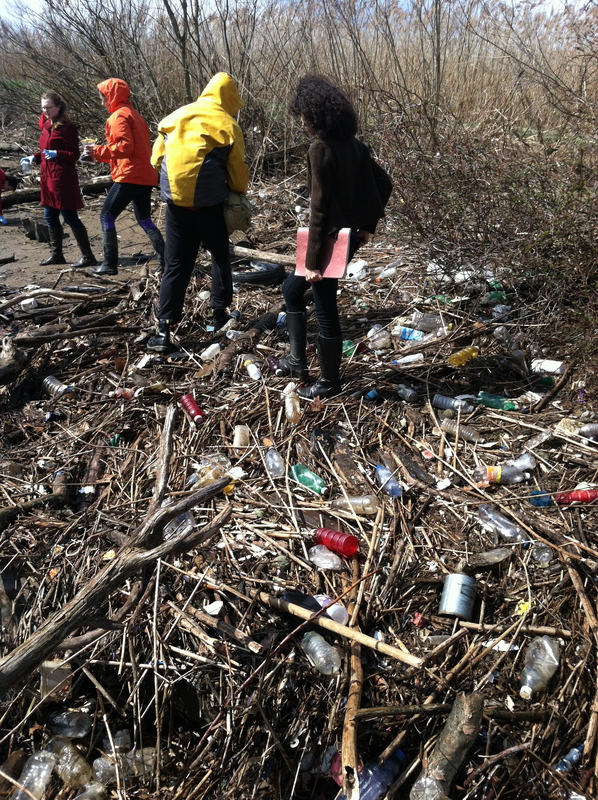 From this location, a jar of dirt no larger than a drinking glass yielded over 500 plastic fragments. We visited several sites, collecting samples from streams and wetlands more or less in our own backyard, but which many of us had never visited. We scooped up sediment and sand in jars, and used Helen’s homemade sampling net to collect particles from flowing water. 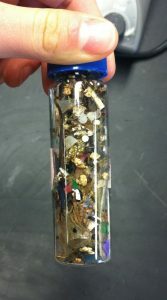 In the lab, our class learned how to isolate microplastics from the samples we had collected, according to guidelines developed by the National Oceanic and Atmospheric Administration, before splitting into small groups to investigate questions of our choosing. My partner and I used infrared (IR) spectroscopy to identify the polymer types of plastic samples, comparing the spectra of environmental samples to standard spectra of known polymers. IR spectroscopy measures the vibration of bonds in organic molecules exposed to infrared radiation, such that the presence of particular types of bonds creates peaks on a spectrum in response to specific wavelengths of radiation. Characteristic IR spectra can thus be used to distinguish between molecular substances based on the types of bonds they contain. The environmental samples, though scratched and distorted, retained the telltale spectral patterns of polyethylene, polypropylene, and polystyrene. Despite being recognizable, the spectra were not identical to those of the standards, and many of the physically weathered samples yielded an additional peak in a region of the spectrum potentially associated with oxidative weathering, which causes the formation of new bonds between carbon and oxygen atoms. These spectra truly speak to the nature of plastic and its problematic, one-way fate. Its weaknesses are revealed as it is bashed about in the environment, exposed to light and heat. It becomes brittle, cracked, melted, and as the IR spectra show us, changed on a molecular level. When I walk by the ocean and find beach glass, it is often broken, dulled and smoothed to a frosty veneer, but it is silica forever and always; I could melt it down and make the same bottle over again. Beach plastic is transfigured, its identity altered. Plastic exists at a cursed juncture of mutability and persistence. It degrades too quickly to retain function in the long term, but much too slowly to disappear in the environment at any rate remotely near that of its production, and thus we are left with accumulation. Despite a few more bonds to oxygen, the underlying molecular structures of the original polymers are here to stay: the specters in the spectra. For science students, it is valuable to enter contexts that lead us to make connections between scientific questions and society. It is especially powerful to think about this on a personal level, in the spaces we inhabit. The sight of plastic piled at the bend in Darby Creek heightened our awareness of the ubiquity of plastic around us, and we discussed how our consumption-driven accumulation of plastic goods feeds into bioaccumulation, delivering plastic and plastic-borne pollutants to aquatic life, and potentially back to humans through the fish we eat. All this plastic prompts me to reflect on petroleum products more generally, and the hold they have on society. Even if we manage to shift away from our current dependence on fossil fuels, what of the petrochemical-derived polymers and coatings that lend form and function to physical objects integral to everyday life? These connections relate to our capabilities and agency as young researchers. Plastic, after all, is a product of laboratory synthesis, as are many harmful chemicals circulating in our environment. In all that we learned about plastic, our watershed, environmental cycles, and biogeochemistry methods, there are important lessons about the choices we have in the legacy we leave. Chloe Wang recently graduated from Haverford College, a small, liberal arts college located in Pennsylvania, USA, where she studied chemistry and environmental studies. She is now assisting with public programming related to the Lower Schuylkill River at Bartram’s Garden, a river garden and outdoor classroom in Philadelphia. Chloe met Carolin and Johanna from PlastX at a conference in the USA, where the idea for this contribution developed.